In 2010 the book, “Icons: The DC Comics and Wildstorm Art of Jim Lee” was published. As you know Jim Lee is the Publisher of DC Comics and one of the most successful and popular artists to work in comics. 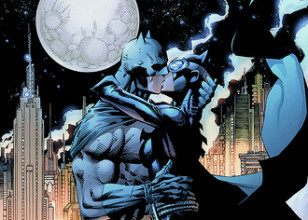 Jim Lee is revered by fans worldwide thanks to his hyper-dynamic artwork and innovative character and costume design. His work on Batman and Superman — not to mention his legion of WildStorm heroes including WildC.A.T.s, Divine Right and Deathblow — was celebrated in this beautiful hardback, which included an exclusive interview with Jim Lee, a tour of his studio and hundreds of full-color illustrations and pencils spanning his entire career. It is still available on Amazon and in bookstores. Three years ago Jim decided he wanted to give signed paper prints of this image to the hard-working DC Comics team. Now we have the approval to finally offer the dramatic canvas to you. Jim Lee, born August 11, 1964, is a Korean American comic-book artist, writer, editor, and publisher. He entered the industry in 1987 as an artist for Marvel Comics, illustrating titles such as Alpha Flight and The Punisher War Journal, before gaining popularity on The Uncanny X-Men. X-Men No. 1, the 1991 spin-off series premiere that Lee penciled and co-wrote with Chris Claremont, remains the best-selling comic book of all time, according to Guinness World Records. In 1992, Lee and several other artists formed their own publishing company, Image Comics, to publish their creator-owned titles, with Lee publishing titles such as WildC.A.T.s and Gen¹³ through his studio Wildstorm Productions. Eschewing the role of publisher in order to return to illustration, Lee sold Wildstorm in 1998 to DC Comics, where he continued to run it as a DC imprint until 2010, as well as illustrating successful titles set in DC's main fictional universe, such as the year-long "Batman: Hush" and "Superman: For Tomorrow" storylines. On February 18, 2010, Jim Lee was announced as the new Co-Publisher of DC Comics with Dan DiDio, both replacing Paul Levitz.